What are your goals for yourself and your team? There are several goals that I have for myself and my team. Some of my goals are concentrated on performance but most are focused on our strength as teammates instead. For me, the definition of a good team is one that is tight-knit and connected off the field, and because of this, plays wonderfully on the field. The chemistry which is fostered off the field is one that can be seen on it as they play together. My goals for my team is to get to that level. To connect and create a chemistry which adds to the playing level. My goals for myself, in that sense, as a captain, is to help my team get to that level. Performance wise, I hope we get to state and win it. I also hope to be best goalie in the state again so that I go out with a bang during my senior year. Are you looking to play at the next level? I am not looking to play at the next level. Now, as a senior, I am starting to regret my decision to not put my hat in the game just because it’s hard to let go of the sport. Yet, as an underclassmen, my focus was academics. So, although I will not be playing at the next level, I do know that I will be playing recreationally. I hope to try out ot be a walk on and a red shirt freshman for my university’s lacrosse team. What school or schools are you looking at to attend? I recently enrolled at the University of Notre Dame. The university’s focus on academics, sports, community, and spirituality are all things I have held dear to me growing up. My love for lacrosse will definitely be continued at Notre Dame, I will go to the games and also play there recreationally. How do you handle the stress of being one of the top goalies in the state? The best way I have taught myself to handle the stress is by not letting the labels get to me. Whilst, yes, hearing that I’m one of the top goalies in the state gives me confidence, it also adds a lot of pressure. So before every game I act like it is my first one. Instead of trying to reach other’s expectations when I step out on the field, I just play as if there are no expectations out there for me and do the best that I can. How do you feel about the team this year compared to last years? This year is unique to ones I have had in the past on the lacrosse team. 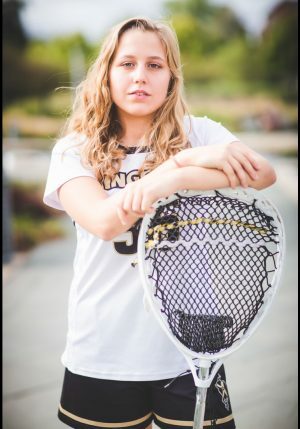 While the idea of the team being a family has been important to Penn Girls Lacrosse since it was created, in the last years that focus has been lessened. Whether it be drama, bad leadership, or people being more individually focused rather than team oriented, our team was lacking greatly in its chemistry. But, this year, I feel as if our team has a fresh start. One in which we all love each other and are ready to work together in attempts to reach the top. Every day at the end of practice one of my fellow captains, Abbi Cook, does the countdown until the whole team chants, “Count on Me.” This year, when I hear my teammates saying those words around me, I know I can trust them whole heartedly.